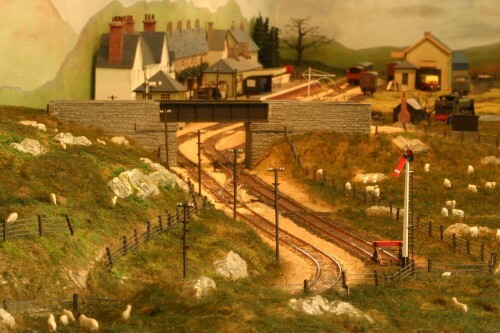 The following article by Bob Freemantle and Mark Stapleton describes Bob's layout, Princetown. 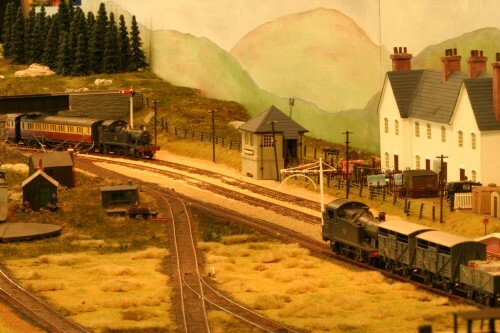 It was the effective use of working semaphore signalling that won this layout the MODRATEC Signalling Prize at the Brisbane Model Train Show in 2010. © The written content of this article copyright 2010 Bob Freemantle and Mark Stapleton. Photos by Graham Fanshawe. Send email for Bob Freemantle and Mark Stapleton via MODRATEC. The home signal is clear in preparation for arrival of a passenger train. 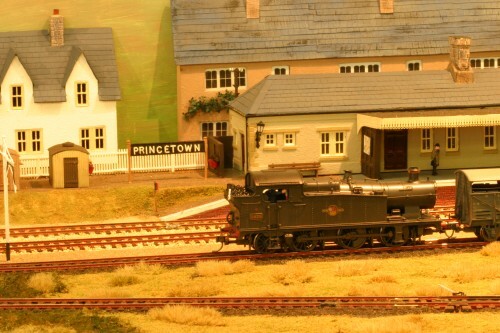 Princetown is the first exhibition layout I have constructed and it is built in OO gauge. The layout shows the line to Princetown, Devon, from the last halt at King Tor to the terminus station at Princetown. It shows the line in the last ten years it was open, before closing on 31st March 1956 with all the line and structures being removed by the end of that year. This is some of the most windswept and desolate country in the British Isles and it was not uncommon in winter for the village of Princetown to be cut off from the rest of the UK. As Dartmoor Prison is situated at Princetown, indeed the very reason the village was built, it was essential that the line was kept open to bring in vital supplies of fuel and food. When I started to research and plan the layout I was determined to include signals, as to me a layout just does not look right without them. From my research I learnt that the station only had two home signals and a number of ground signals in the yard and station area. I also wanted to show the point rodding and get the signals to work. The other item on my wish list was to have some form of auto running, as the layout is a fiddle yard to terminus type. In discussing these wishes with BRMA [British Railway Modellers of Australia - ed] Westside members, Mark Stapleton offered to design and build a system that would not only control the auto train feature but also operate the signals. After a number of tests and trials we settled on the system that is now installed on the layout. The signals installed are Ratio Kits and were built by Ron Everingham and myself but we have found that they can be quite fragile. I have rebuilt most of them with brass parts replacing some of the plastic components. Fulgurex motors under the baseboard now work the signals. The home signal sets off a very effective and carefully detailed view. One last job that remains to be completed is the building and installation of the point rodding. All the components have been purchased and are ready to be built and installed in due course. At the Brisbane Train Show I was asked a number of times if there were any plans to make the ground signals work but at this point in time there is no plan to do this. In building the Princetown layout I received assistance from a number of fellow BRMA Westside members, which has been most appreciated. When Princetown was in the design stages, mention was made of having automatic running from the fiddle yard to the platform at Princetown and return. This was to give the operators a break and if one was there alone you could wander off and get a cup of coffee and still have trains running back and forth. As the design progressed for this it was mentioned that the semaphore signals will be working wont they. Changes to designs were made to account for this new turn of events. 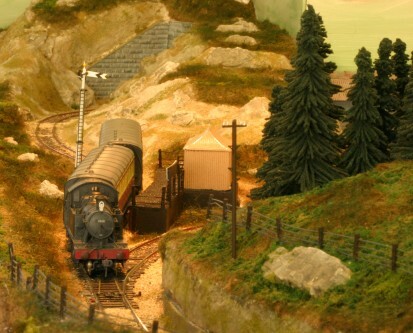 The approaching passenger train passes the distant signal at King Tor halt. 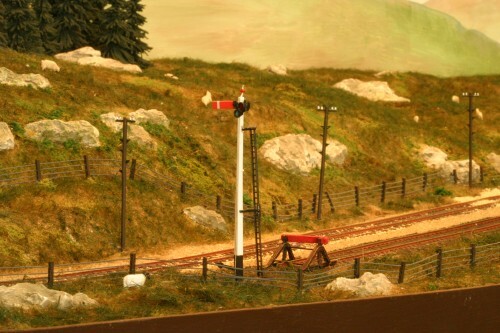 Ratio semaphore signals were used on the layout; there is a Distant, a Home and a Starter signal. First problem was how to drive them; a number of ideas were looked at, peco solenoid motor, memory wire, Viessman motion drive for signal, Tortoise slow motion motor and a Fulgurex slow motion motor. In the end it was decided to use the Fulgurex motor for ease of mounting and the ease of connecting to its throw arm. A 75mm long piece of steel wire from the K & S range was used to connect from the motor to the Ratio signal, this wire was just bent to shape. I must admit that the Viessman motion drive for signals was a much smoother action on the signal but it did not have enough torque and was not working every time, the other issue was at 12v it was at the low end of its working range and required a higher voltage supply to work it, shame really. After testing the signal with the connection to the point motor and it was found to work ever time, thoughts turned to how it was to be controlled. First thought was CMOS logic driving relays, then a PICAXE micro-controller was looked at. One of these was purchased and programming began. Once this was worked out then the relay interface was designed. The system has 2 modes the first is for manual control of the signals. There are two switches on the control panel one for the starter and one for the home and distant. Throwing the switch for the starter signal on the end of the platform sends a bit to one of the inputs of the micro-controller, this picks a relay on the output of the Micro-controller and the signal clears, put the switch back and the signal returns to the stop position. The Home signal is also controlled by a switch that is feed into the micro-controller so the micro-controller sees the signal needs to be cleared sends a feed out to the relay which drives the Fulgurex motor which clears the signal, three seconds later another relay for the distant signal is picked by the micro-controller and then the distant signal clears. Both Home and Distant signals are controlled by the one switch with the micro-controller giving the delay between the signals clearing. When put back to stop the reverse happens, the distant signal goes to stop then three seconds later the Home signal goes to stop. The passenger train arrives while a goods stands in the yard. When used in Automatic mode the train starts in the fiddle yard, the micro-controller drops the Brake relay for the inertia controller, this then turns on the train controller and the train slowly leaves the yard, the Micro-controller then clears the Home signal, and the Distant signal three seconds later. The train continues to almost the platform where it passes over an infra red detector which tells the Micro-controller to place the Distant and Home signals to stop and picks up the brake relay to apply the brake to the inertia controller to slow the train as it arrives into the platform. After a 15 second time delay the Starter signal is cleared by the Micro-controller then the brake relay is released, the train slowly gathers speed as it leaves the station and heads back to the fiddle yard. When it arrives in the fiddle yard the train passes over another infra red detector which places the Starter signal back to stop and applies the brake to the inertia controller stopping the train in the siding, after 20 seconds the process repeats itself. All in all a very satisfying outcome for a cup of coffee. The view across the yard at Princetown.